The levels are obstacle courses which you master by running, jumping, or dashing, or by phasing through walls. Your sidekick, a little bird, is not only your trusty companion on your odyssey, but it also serves as an indicator for the ability to jump. If it touches you, you’re good to bounce. As I began to play, much of my time was spent planning which buttons I would push at which point in the level. To my dismay, I realized that after a certain time, the level fills up with the worm’s stomach acid. A better strategy was simply to move more and think less. I was freed from a certain obsessive compulsion, yet trapped into making a lot of mistakes. I played and replayed one level countless times until I reached the level’s goal and finally moved on to the next. Slime-san encourages you to let go, develop reflexes, and apply them intuitively. The results of gameplay are somewhat like video game improv: Don’t think. Do. Always say, 'Yes, and…' While navigating a level, you think to yourself: I’ll jump to that platform over there. Yes, and… from there I’ll permeate through a wall of organ tissue. Yes, and… with the momentum gained, I can glide up another wall and complete the level! Slowly, my reflexes became used to the controls, and the flow of the game helped me intuit moves which before had eluded me. There is a whole subculture where the skills acquired can be applied: speedrunning. Speedrunning is the practice of trying to beat a level or an entire game in as little time as possible. To satisfy its players’ competitiveness, Slime-san also offers a ranking system which lists the best times at which the levels were completed. Here, players speedrunning the game can check their time against other players and compete for the record. Last time I checked for Level 1, nitro was at the top with 12:77 seconds. Whoever that is, now they’re famous, and their endless hours invested into training on how to maneuver a ball of slime paid off. It’s time show them haters, nitro! 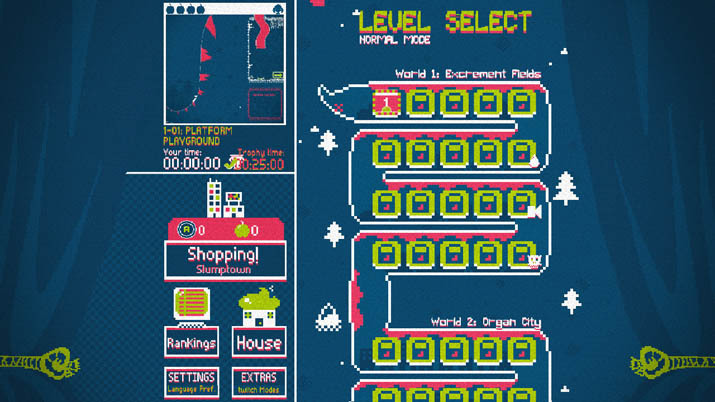 From another option in the start menu, Slime-san can enter a city within the worm’s belly. There, the little protagonist can head to different quarters where he can find an arcade, complete with mini-games; a shopping mall, to change appearance with accessories; or a drug store, where he can buy power-ups. I can easily imagine a crew of enthusiasts gathered around Slime-san, helping each other out to master a level, and improving their times on the scoreboard -- all sharing a pitcher of Mountain Dew. 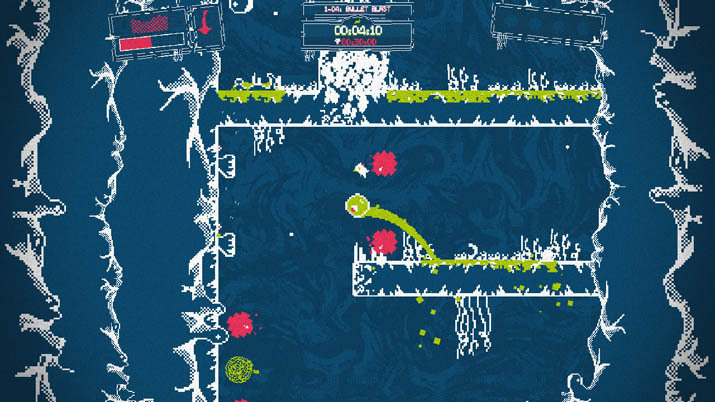 Slime-San includes a plethora of extra features that keep a single player entertained, and the design shows diligence from the developer. That being said, the title doesn’t necessarily hold the player’s attention with the repetitive levels and gameplay mechanics. Slime-san is entertaining for a while, with its appealing 8-bit graphics and platformer gameplay. You can play it to relax and meditate on each level and, if you enjoy playing it in a group setting, you have a title that facilitates interaction, passes the time, and has cult potential.